All of my videos are now hosted on Veer, my new platform of choice for presenting 360 videos and photos. You can find everything on my Veer Channel. If you have a strong connection, be sure to select “2160” in the quality setting for the 4k experience. This is the first video I recorded with my 6 GoPro camera system. The original was 8K video. 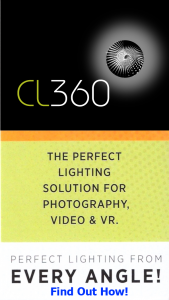 This is a demonstration of my exclusive 360 video lighting instrument. I am in the process of finding a manufacturer for this patent pending design. See http://cameralight360.com for more details! In July 2018, a community sing-a-long of Rodgers & Hammerstein songs, in front of the home of Oscar Hammerstein II, where these musical classics were written. Recorded with the 6 GoPro camera system. The first video features a speech by Arun Gandhi, grandson of Mahatma Gandhi. This proved a wonderful opportunity to bring his messages of peace to the VR audience. The second video featured the guest speakers reading quotes from Hammerstein, followed by leading the crowd into the theme from Oklahoma! A ” moment of zen” video recorded using the 6 GoPro camera system. Stitched with Autopano Video & edited on Final Cut Pro X. This is the grounds of Fonthill in Doylestown, PA, including an abandoned 18th Century farmhouse nestled in the middle of woodlands. This video was recorded in 2017, using 2 KODAK SP360 4K cameras. A time lapse of two hours of a sunrise over a historic cemetery in Doylestown, PA.
November, 2018: A return to the fantastic historic Doylestown, PA cemetery with my six GoPro Hero5 Session rig to capture the essence of autumn colors and falling leaves.